Over the last decade, no issue has taxed NEMT more than the damage done to numerous glens, moorlands and mountain sides by the proliferation of badly constructed, and often illegal, hill tracks. More recently, NEMT has been part of a campaign co-ordinated by Scottish Environment LINK to press the Scottish Government to change the law to ensure that planning consent is required for all such tracks, thus removing the anomalies and loopholes in the system. Since the last Mountain Views, there has been continuous activity. Scottish Land and Estates (SLE - the estate owners club) published its report, "The Way Ahead for Constructed Private Tracks", claiming that the existing system is working well. This document is available on the SLE website. In April, LINK kept up the pressure by publishing a response, a copy of which is available on NEMT¡¦s website. During June, NEMT and LINK had a further round of encouraging people to write to the Minister and their local MSPs in order to maintain pressure on the Government. NEMT and the Cairngorms Campaign wrote again to the Government arguing for change. Parliamentary questions were asked. Planning Controls on Hill Tracks The Minister for Local Government and Planning has announced that we will be laying before Parliament amendments to the General Permitted Development Order to require prior notification to planning authorities where private ways for agricultural or forestry uses are proposed (often known as hill tracks or simply tracks). The planning authority can then consider whether or not prior approval is required for the siting, design or materials used for the track. The requirement for prior notification will apply across the whole of Scotland. The legislation will be laid in Parliament following the referendum. The amendments would allow control of tracks in areas where it is considered that additional protection of amenity, landscape or environment is required, while not imposing any significant additional burden on businesses in other areas. Thereafter we will continue to monitor the situation and effectiveness of the changes. What the government has decided to do still leaves a democratic deficit. Hill tracks are, in the main, significant infrastructure projects and it is simply wrong that a number of them will continued to be constructed without there being the opportunity for members of the public and concerned bodies to comment. The timescale being proposed for planning authorities to make decisions is completely unrealistic (28 days for initial determinations). Unless this is changed, it is likely that some applications will simply slip through without adequate scrutiny. On the plus side, the Minister has stated that a working group, which will include representation from LINK, will draw up guidance for planning authorities and the Government intends to monitor the workings of the new regulations. After all the efforts of many people over a number of years, should we be pleased? NEMT gives the Minister's decision a cautious welcome while believing that this is not the best option and that certain practical matters need to be addressed. The LINK Campaign group is writing to the Minister raising a variety of issues. The campaign is continuing to gather evidence, so if people find examples of new tracks it would be very helpful if they could photograph these and send them in, along with any supporting information. 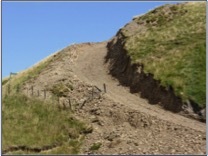 This can be done by email (hilltracks@scotlink.org) or by posting on Twitter using #hilltracks.